Photo copyright Roy Kilgard, used with permission. 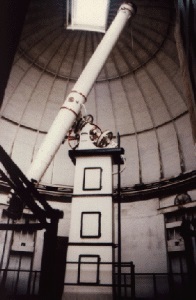 This historic telescope was dedicated in 1916, but not installed until 1922 because of a delay in getting the glass lens blank from Germany during World War 1. However, the glass was of better quality than expected, allowing 20″ of full aperture instead of 18.5″. The lens was ground by Alvan Clark & Sons of Massachusetts, and has a focal length of 27’6″. 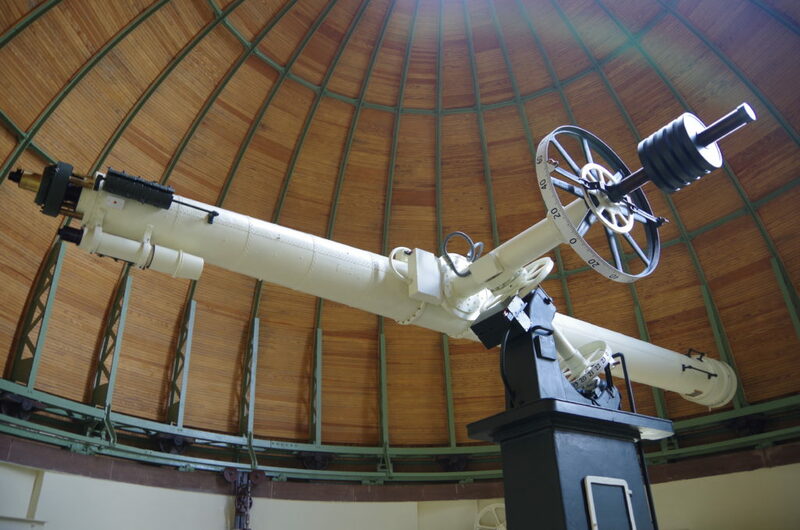 This telescope has recently been fully restored to like-new condition, and upgraded to computer control. This page lacks sufficient space to give the 20″ all the credit it deserves, and also to Wesleyan University for keeping it alive and in operation, and accessible to the general public. Under sky conditions with “good seeing” (low atmospheric turbulence), world-class views of planets in particular, and other objects, may be had through this telescope. Public Observing Schedule at V.V.O.